What is Low-Level Light Therapy (LLLT)? Low-Level Light Therapy (LLLT) is a safe, effective treatment that is painless and is completely non-invasive. It uses a non-thermal (cool) laser in low-level to bathe the scalp and hair in a pure therapeutic red light. This therapeutic light produces a thicker looking and fuller feeling head of hair. As the hair cell is among the fastest growing cells in the body, the effect of laser light treatments on the scalp and hair is very beneficial in creating the energizing effect that enhances the appearance and feel of the hair. We start with a free consultation and evaluation including a micro-video examination of your scalp and hair to determine if you are a good candidate. Based on the results of this evaluation, we begin an aggressive treatment program. The program includes 30-minute laser sessions twice a week. We may also recommend supplements that complement the low-level laser therapy, and enhance long-term retention of your improved hair quality. The program involves 6 to 12 months of treatments, along with scheduled evaluations to monitor your progress, until we have achieved your body’s maximum capability to improve. Users usually experience about 35% of hair growth. We use the most scientifically advanced cosmetic lasers that are fully FDA-compliant for safety. Over 50 laser diodes are precisely aligned in the laser hood to completely bathe the scalp and hair in therapeutic light from all angles. The iGrow System is a hands-free treatment. 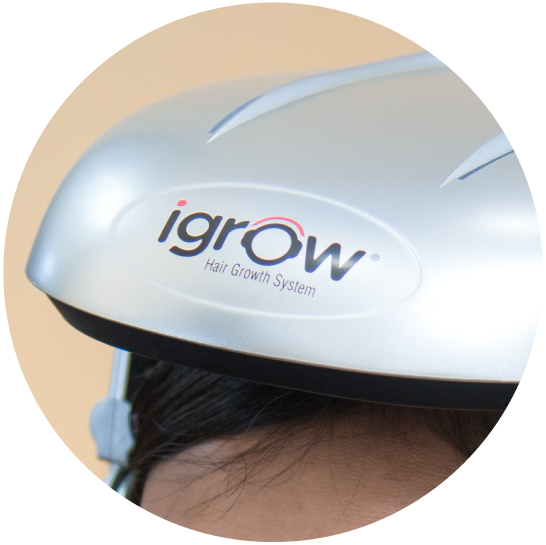 To secure the iGrow system, which resembles the shape of a helmet, the device sits on top of the user’s head for stability, comes with built-in headphones and a programmable remote.